Gift-giving: An expert weighs in on KRE-O Transformers kits. Nothing but boys at my house… Have I mentioned this? 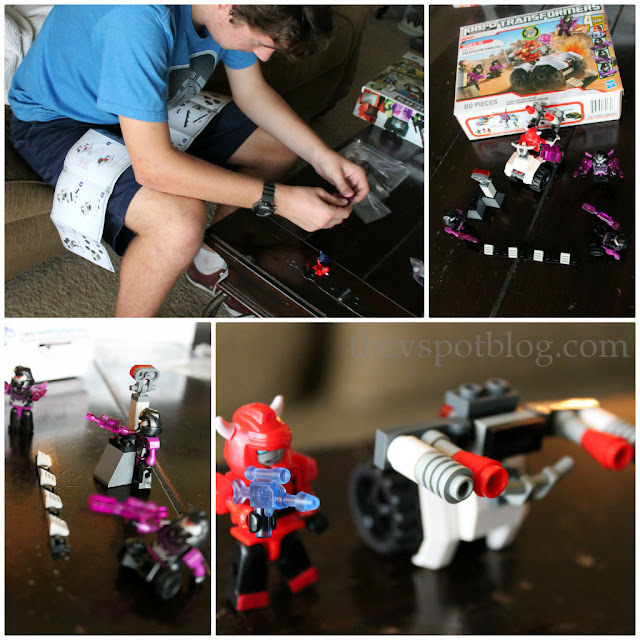 No matter what their age (and I am including Handsome Hubby in this group) as far as I can tell, there are three themes when it comes to playing with their toys: Build, Destroy, or Go-Fast. 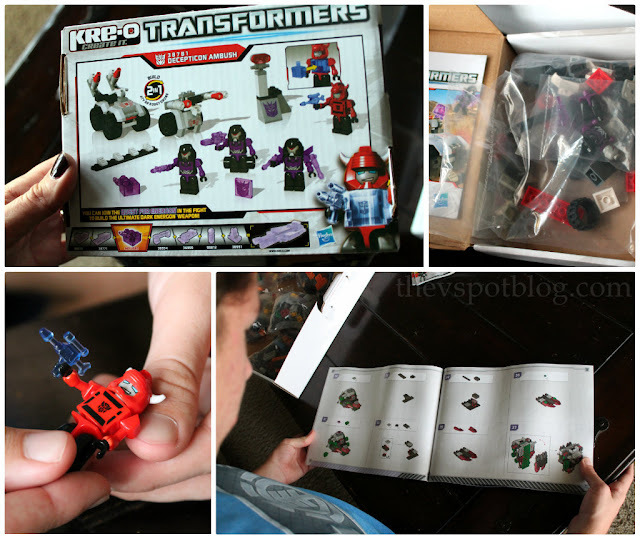 When I got the opportunity to review the new KRE-O Transformers toys from Hasbro, I was super excited. I was sure it would be something that Grant, in particular, would love. 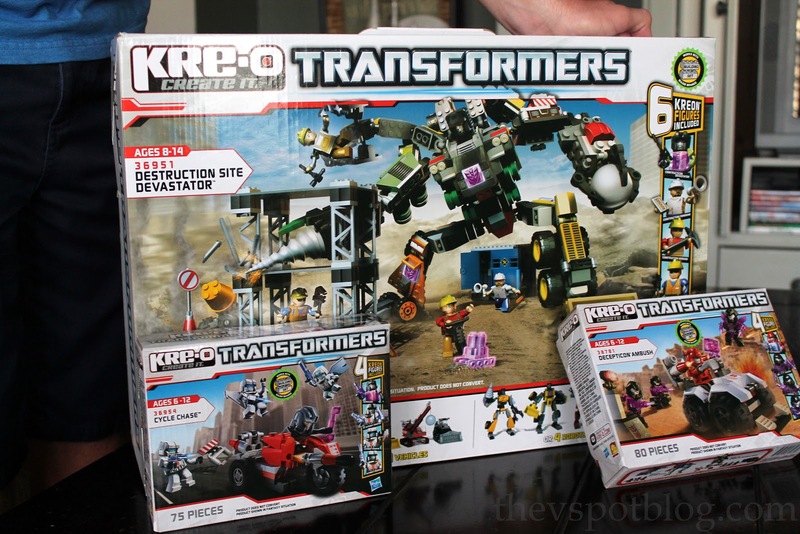 I was sent the Cycle Chase and Decepticon Ambush mini-sets, and the Destruction Site Devastator set. 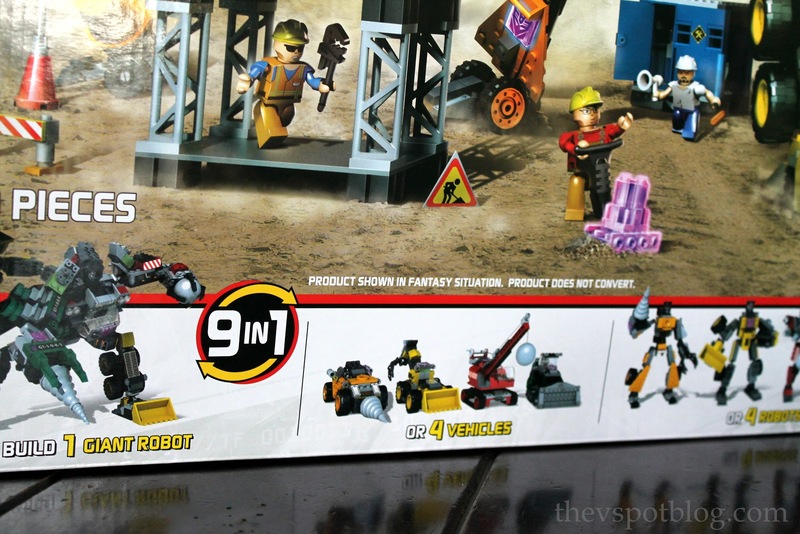 These sets are pretty cool, since the Transformers characters can be built in either their vehicle or robot modes, using the same building pieces. It’s kind of like 2 characters in 1. The Destruction Site Devastator set…? 9 toys in 1. That’s a lot of building. Grant is a prime candidate for the age group these building sets are meant for. He loves to build things, he loves the Transformers franchise, and he’s between the recommended ages of 8 – 14. Is it easy enough for an 8 year old to put together alone? Is it challenging enough to keep him interested? Once the kit has been built, does it encourage more play? Is it fun enough for a Big Brother to play along with the little guy? So I gave Conner one of the sets and got his take on it. Conner tried out the Decepticon Ambush set. He said the instructions were clear and the pieces were clearly marked, and that Grant could also “mix and match” some of the figures if he wanted to deviate from the intended scenario. Conner also said that Grant could have play battles once the set was built, which is something he likes to do. (And 16 year old Conner said he would be willing to play along with his little brother…) In other words, it met the criteria we set above. I think that’s one of the yardsticks by which I (as a parent) measure the success of a toy… does it create an opportunity for the kids to play together? These will. There are times when I feel like it’s really difficult to choose gifts for the boys, and there are times when I am really confident they will love the gift. I’m confident that Grant is going to have lots of fun with these sets. Be sure to check out Hasbro’s website for more information, and follow them on Twitter and Facebook. That is so cute! I love that Conner tested it out for him. It looks like an awesome set! I wish they had these when my son was small. He would have LOVED them! These look like so much fun! My oldest LOVES the Transformers. He too young for this toy now, but I could see him wanting it in a couple of years! So fun! Those look great. I can’t wait to see the look on Grant’s face when he gets that set, share with us! Our boys are loving these kits!!! It’s wonderful that they can make so many different things from one box! Fantastic. Great plan to have older brother road test them. Love these types of toys! What a fun toy! Sounds like one that my girls and I would enjoy as well! My son is 10 and loves these sets! They “play well” with Legos too!